Commissioning a portrait by Richard Kitson offers a different experience in that the subject is required to sit for the entire duration of its creation. To own a portrait by Richard is to enter into and support his ethos of working solely from life in order to achieve the best possible result. Commissioning a portrait by Richard is a big commitment as well as an opportunity to own something totally unique. Please read the following guidance before enquiring. 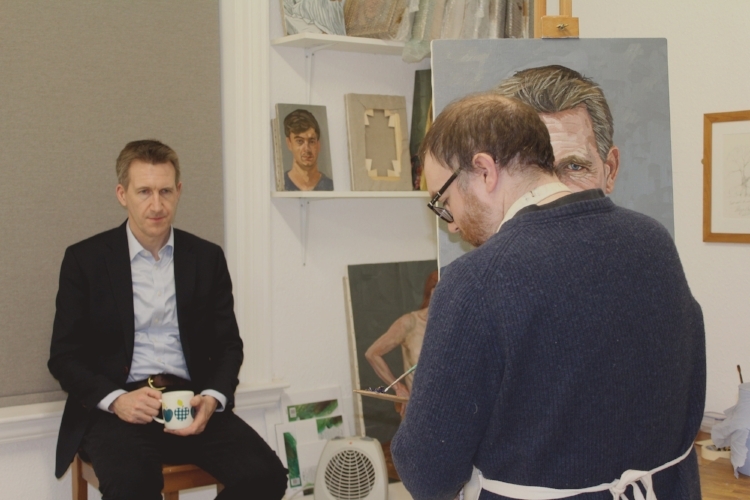 Richard Kitson painting Sheffield City Region Mayor and Barnsley Central MP Dan Jarvis MBE. Initial consultation. After reading the following guidance simply send an enquiry via the contact page with as much information as possible about the portrait you want to commission. A guide to typical sizes and prices can be found at the bottom of this page. Once you have decided on the size and subject of the portrait Richard will discuss the best time for the sitter to visit his studio for the duration of the painting process. Please note that Richard reserves the right the use the image of your portrait for promotions and to reproduce it in any future publications. Where and how often do I have to sit? Typically one evening per week for two hours at Richard's studio in Barnsley town centre. A little flexibility with times is always appreciated. Tea and biscuits are provided as standard. What can I expect during the painting process? Typically Richard will start with a drawing as a way of getting to know his new subject. Once he is happy he has the right composition he will begin painting. Please do. The advantage of painting from life is that you can relax and talk. Sitting for a portrait can be quite relaxing, offering a rare opportunity to just sit, be still and reflect. Richard will politely ask for quiet if he is painting your mouth for example. Anything you like. Richard wants to paint you as you are so just wear something comfortable. You can always bring a few options to look at. Just remember to wear the same thing for every sitting and don't plan any radical changes to your hair half way through the painting. If you wear makeup please keep it to a bare minimum. Please no heavy eye liner, eye shadow, blusher or lipstick. You are lovely just as you are. Yes. A non-refundable 20% deposit is required once the commission has been agreed. This can be paid in cash at the first sitting or via PayPal or Bank Transfer. Prices start at £1000 for a 10” x 8” portrait in oils and £300 for a 12” x 9” drawing. Clients can expect to sit for ten weeks (approx.) for a painted portrait and up to three weeks for a drawing. Please contact Richard to discuss larger sizes and portraits with more than one subject. The cost of framing is additional, to be agreed on completion of the portrait. Framing is very important to Richard as it must complement the painting and the sitter as much as your home décor.